Heading out from the Gisborne Marina the first birds were 6 little black shags sitting on the marina wall as we steamed past. A pied shag, and a pair of Paradise ducks were seen a few hundred metres offshore and then we started to see a few tubenoses. 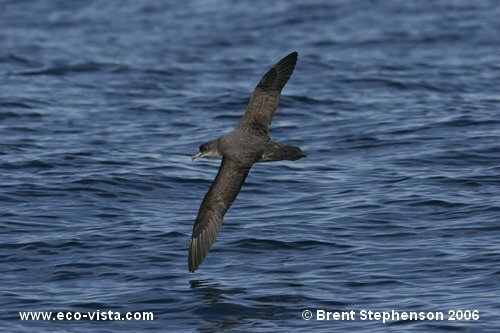 Fluttering shearwaters in low numbers trickled past us, and then we had three single common diving petrels relatively close inshore. 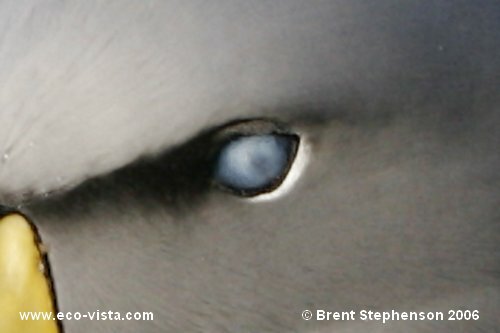 A couple ofAustralasian gannets, white-fronted terns, and two Cape petrels put in an appearance. Arriving at our first chumming location (S 38 48.730’, E 178 17.188’) in about 80m of water we started to put out a bit of chum. 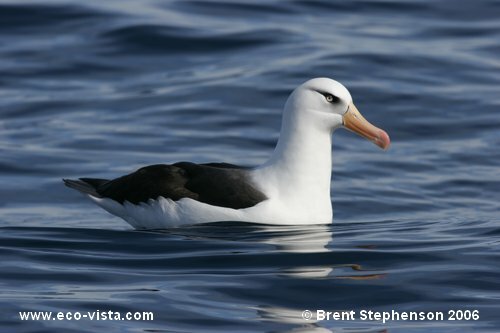 We stole the attending birds from another nearby recreational fishing boat, and after about half an hour had a Gibson’s, 2 Campbell, 1 black-browed, and two imm white-capped albs, with a Northern giant pet and small numbers of Cape petrels. Deciding that there were better birds out deeper we headed out towards the dropoff to our second chumming location (S 38 49.341’, E 178 22.300’) in about 500+ m of water. 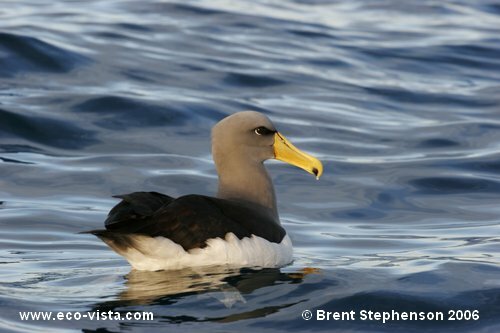 On the way we saw a fur seal, but more importantly a Northern Royal alb signalled better things to come, and as we pulled up in the wake of a steaming long-liner we managed to pull in a few of the birds that were following it. 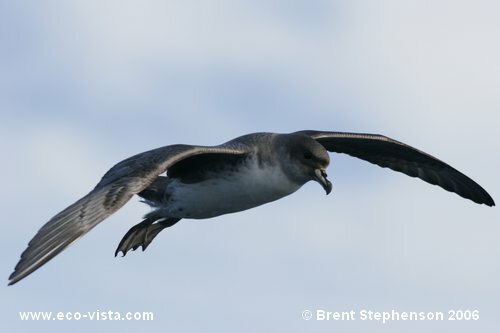 After about 5 minutes the first of several GREY PETRELS arrived and put on a good show landing right beside the boat, and then showing well by flying around the boat. An imm Southern giant petrel also fed at the back of the boat making an easy comparison with the good numbers of Northern giant petrels around us, and after just under an hour we had possibly the highest number of Wandering albs around the boat that I have ever seen – there were about 40 Gibson’s and 2-4 Antipodean type birds. Several of the Wanderers were very pale, but in general most the Gibson’s were quite pale, possibly older birds. I took several photos of these very pale birds, one of which seemed quite large, with a relatively large bill, and was possibly a Snowy alb. This latter bird had the waxy ear mark of a breeding bird, so not sure if this would with a Snowy alb at this distant location and this time of the year? By the time we left we had attracted 8 (9?) 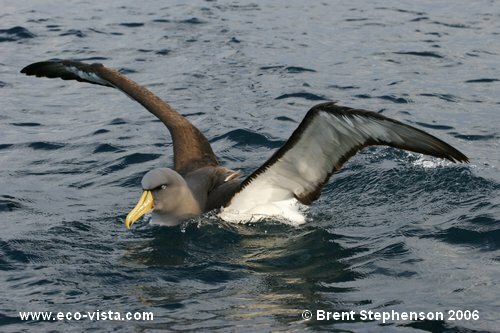 taxa of albatross (Northern Royal, Southern Royal, Gibson’s, Antipodean, Salvin’s, white-capped, black-browed, and Campbell)…..not bad! We then headed to a third location for a change of scene, and a spot of blue-nose fishing (unsuccessful unfortunately, although I thought I had a whopper on the line!) (approx S 38 50.794’, E 178 18.923’). We weren’t successful in attracting too many birds either, so headed further south to a distant long-liner which appeared to have a few birds around it. The ship already had its line down and was waiting to lift, so we checked out a few of the birds hanging around the vicinity and started to put out a bit of our own chum. We managed to attract at least 2, possibly 3, grey petrels and again had great views of them right beside the boat and flying around. Again a good tally of albs, possibly many of them the same birds we had seen earlier. We then cruised the area as the first long-liner we had seen this morning returned discarding fish and frames as it went. Similar species in similar numbers attending, and we watched a Gibson’s swallow the whole head of a rather large hapuka – fairly amusing…..it steadily drifted off into the distance with a very distended neck, and not even an attempt to fly! The two long-liners almost converged, and as the second one started to haul its line we followed beside it watching their catch come onboard and the attending seabirds. A single fairy prion was the only new bird to make an appearance. After doing this for almost an hour we decided it was time to head for home. 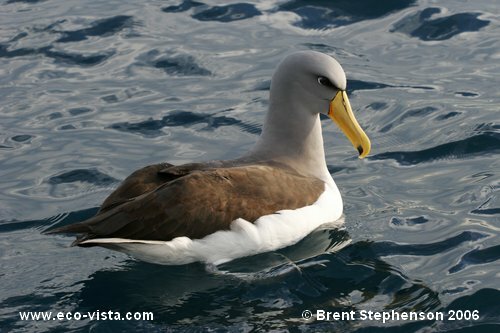 Just as we made the decision to head for home, the best bird of the day dropped right in front of us, and the guys on the long-liner probably wondered what on earth was going on when all of a sudden I yelled “CHATHAM ALBATROSS!!!!”. The bird was unlike any of the other Chatham albies I have seen around the mainland, not the usual timid stand-offish approach, this bird was right beside the boat and put on a fantastic show. We were able to clearly see that it’s left eye was milky and appeared damaged, but it seemed to be able to see from it still, at least partially. We gave it a good feed of out remaining chum and got a heap of photos in the really nice late afternoon light. 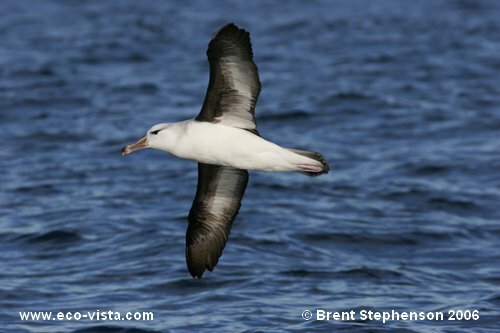 This was the 9th taxa of albatross for the day – something to rival Kaikoura and I’m not sure I can remember a pelagic on which we have had such great views of so many albatross taxa. This is the second Gisborne trip we have done, and we have had Chatham albs on both – 100% strike rate! A very happy team headed back to the Marina, seeing three single grey-faced petrels heading northwards (possibly back to breeding sites near East Cape) arriving at 1820 just after dark. Two of the palest Wandering albies seen on the day. 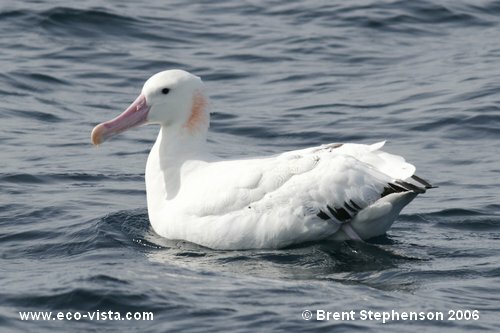 There is the possibility that these are just very pale Gibson’s birds, but the one on the left also seem a lot larger than some of the other birds present around the boat, and the size of its bill is relatively large, indicating it could be a Snowy. The bird clearly shows the waxy mark below the ear indicative of a breeding bird…..so does this help either argument? At least two grey petrel, probably several more during the course of the day, put on a good show around the boat. With both adult Campbell and black-browed albatross present around the boat it was interesting to see immature birds present as well….but which taxa are these? There were also some very young birds present with dark necks, possibly just first-year birds. 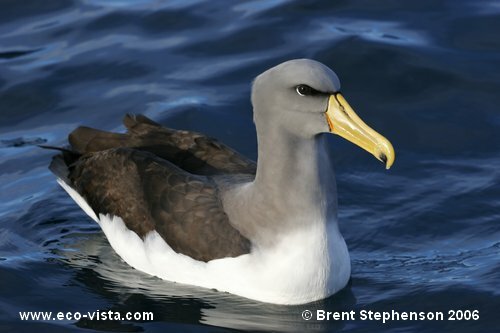 Campbell albatross, a really stunning species up close! 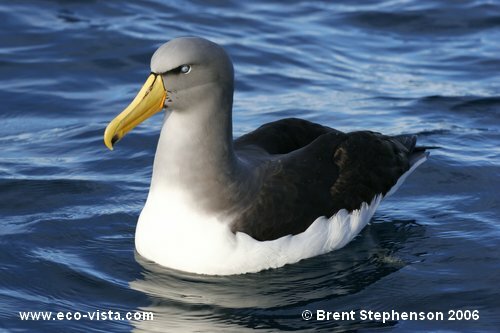 But the prize for ‘stunning’ goes to the Chatham albatross! This bird dropped right in front of the boat as the skipper was starting up to head home for the day! 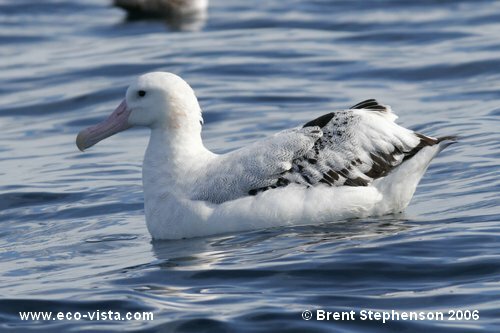 Fantastic sightings of this species seen very infrequently off the NZ mainland (although we have now seen them on both winter trips of Gisborne – 100% strike rate!!). This bird had a milky left eye, which it seemed to still be able to see out of. 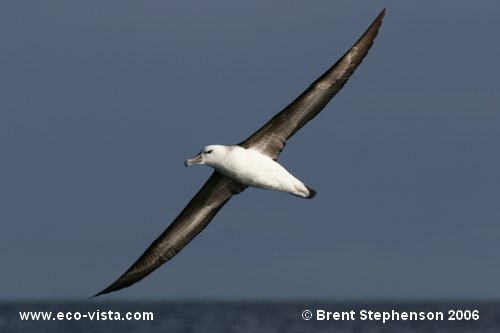 I have not seen this before in any albatross. What a stunning bird, the light was just fantastic and we couldn’t have asked for better photographic opportunities. Other Chatham albs I have seen have never been this confiding and interested in the boat.